Ajay Devgn and family photographed at the Mumbai airport. 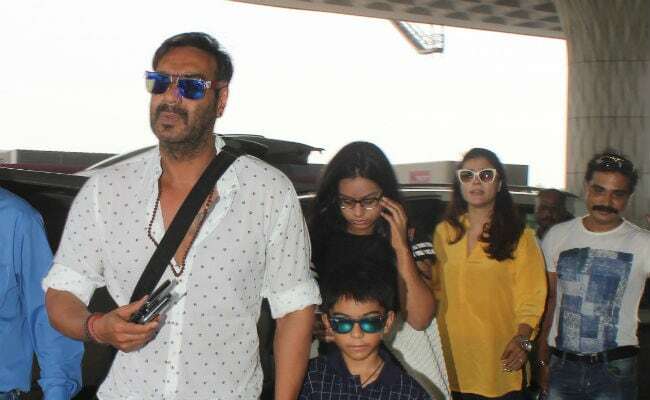 After celebrating the Diwali festivities in high spirit, actor Ajay Devgn along with his family is off for a family vacation and were spotted at the Mumbai airport on Friday. The 48-year-old actor was photographed with wife actress Kajol and children - son Yug, 7, and daughter Nysa, 14. It seems the Devgn family is off for a vacation to spend some quality time together. 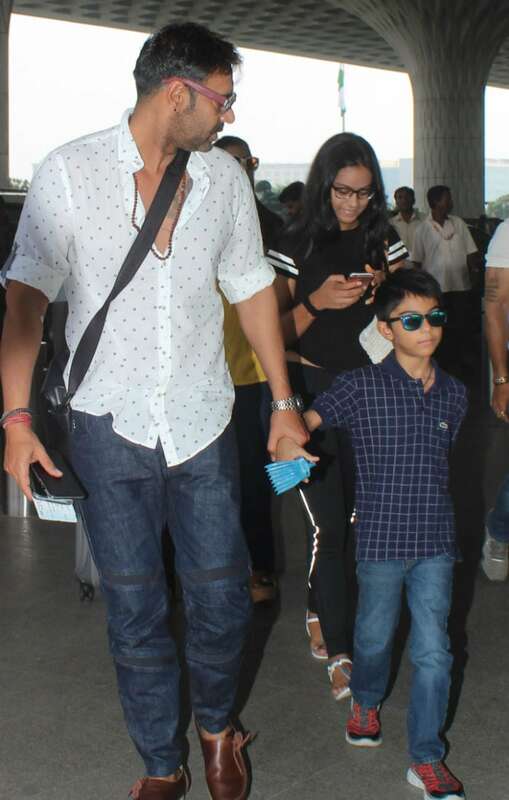 Ajay Devgn was seen hand-in-hand with Yug, who was twinning with his father in sunglasses. Yug and Ajay Devgn were dressed in casuals while Kajol wore a yellow shirt paired with denims. She accessorised her airport look with vintage cat eye sunglasses. Nysa was dressed in a black outfit, which appeared to be a track suit. The 14-year-old girl was busy in her phone. As the paparazzi followed them, the Devgns were seen making their way towards the check-in gate. 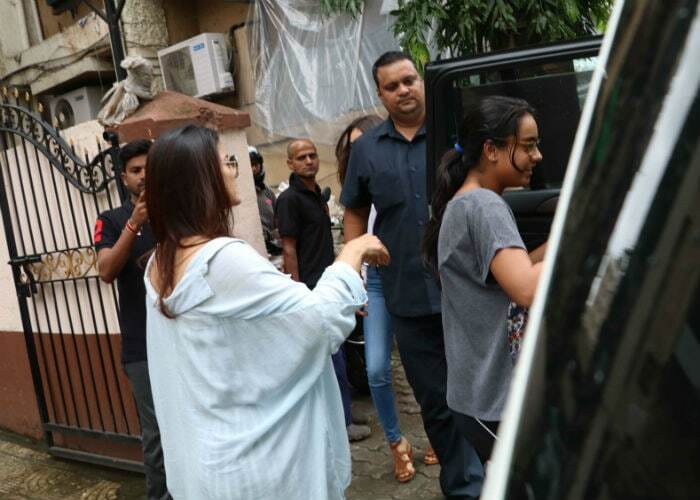 A couple of months back, Kajol was also spotted with daughter Nysa at Bandra in Mumbai over a lunch date. It appeared that the mother-daughter duo indulged in some shopping before lunch. Kajol and Ajay fell in love on the sets of their 1997's film Ishq. They got married in 1999. Ajay and Kajol co-starred in films like Raju Chacha and Pyar Toh Hona Hi Tha. In a recent interview with news agency PTI, Kajol revealed that she and husband Ajay try to shield their children from the media. 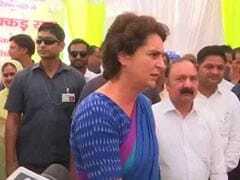 "Ajay and I consciously chose to keep kids away from media. Keeping them away from the spotlight at large is an attempt to give the children their space where they are not bogged down by any kind of pressure," PTI quoted Kajol as saying. Kajol also talked about Nysa's career plans. She said, "She has no aspirations towards anything right now because she is too young. She is right now leaning towards no homework and vegetating on the sofa. She is in that space and enjoying and acting isn't on her mind." At the NDTV India Youth For Change Conclave, Ajay Devgn also spoke about his seven-year-old son. He said, "When I asked my son what does he want to become, he answered that 'I also want to be an actor.' Further when I asked him 'Why do you want to be an actor?' Yug replied, 'I want to make money'." Ajay Devgn shared his views how he responded to Yug's comments. "If that is your approach, then this industry is not a place for you to be. If you have passion and you're ready to prove yourself, then you're automatically a star," Ajay Devgn said. Ajay Devgn's latest film Golmaal Again, another film of the Golmaal franchise, released this Friday and has recieved a good response from the audience.